He was rescued and the little girl was given some candy in return. 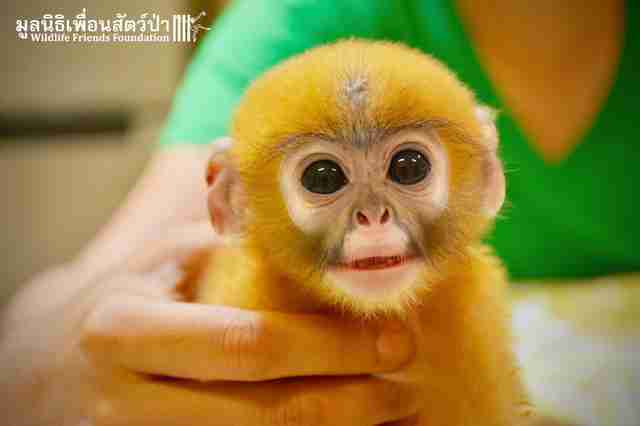 When a family in Thailand discovered a tiny baby monkey on a rubber plantation near their house, they thought they were doing the right thing by taking the vulnerable little animal in. The family's toddler quickly gravitated toward the monkey, a dusky langur, also known as a dusky leaf monkey. Sadly, the dusky langur's cuteness often is a detriment to his well-being; in addition to threats to the species like habitat loss and hunting, the dusky langur is also trafficked in the exotic pet trade (an illegal network that seems to have increasingly moved online in recent years) because of his cute, petite features. Unfortunately, the toddler treated the animal like a living toy — and the family quickly realized that it had no idea how to care for a wild animal, however small and toy-like he seemed. Wildlife rescue organizations exist for precisely this reason — to help animals who have somehow lost their ability to live in the wild. 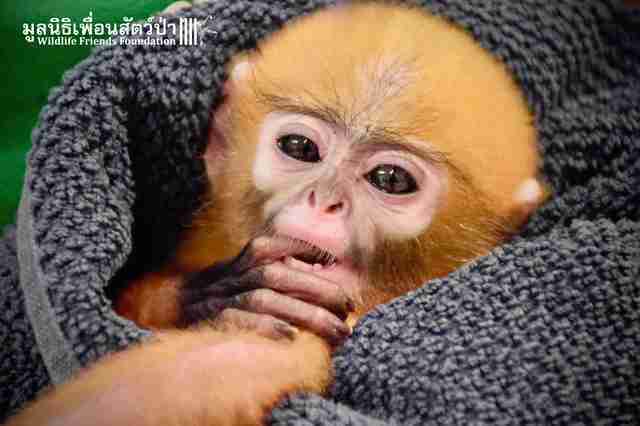 "On Monday afternoon we received a call about a baby dusky langur that had been found on a rubber plantation in the south of Thailand," Wildlife Friends Foundation Thailand (WFFT) wrote this week. 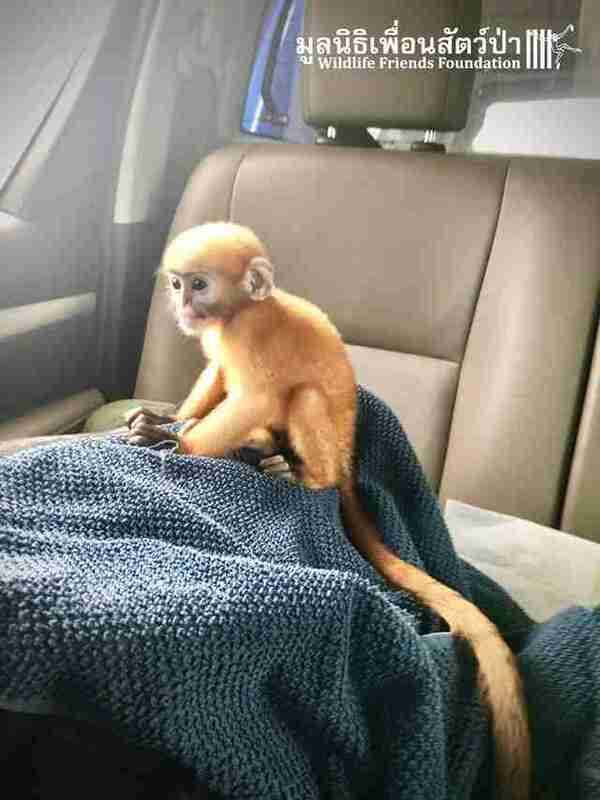 "Despite the prospect of a 16-hour round-trip drive the team wasted no time in setting off to rescue this little monkey." Now known as Vincent, after Van Gogh, because one of his ears is missing a piece (no one knows how he got this injury), the monkey who had been treated as a toy got a stuffed animal of his own, so — lacking his mom — he could have something to hold that helped him feel safe and comfortable as rescuers drove him back to the rehabilitation center. The little toddler who had become attached to Vincent was given some candy to make the departure of her "toy" easier. "We don’t know how these farmers came into possession of this infant, or how he came to lose part of his right ear," WFFT wrote. "They had clearly tried to do their best for him, but their child thought he was her living toy and treated him like a rag doll. The mother quickly realized the demands of keeping this animal." 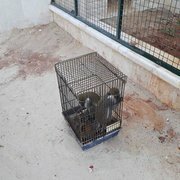 Langurs, especially ones so young, have specialized diets and needs and so they suffer greatly in captivity, WFFT said. "Baby langurs are extremely cute and popular in the illegal wildlife trade ... Time is crucial with these delicate little animals." 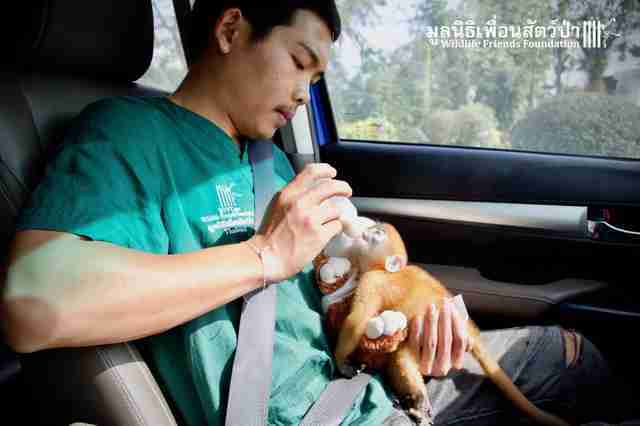 Rescuers stopped to feed the little guy every two hours on the 16-hour drive through Thailand. 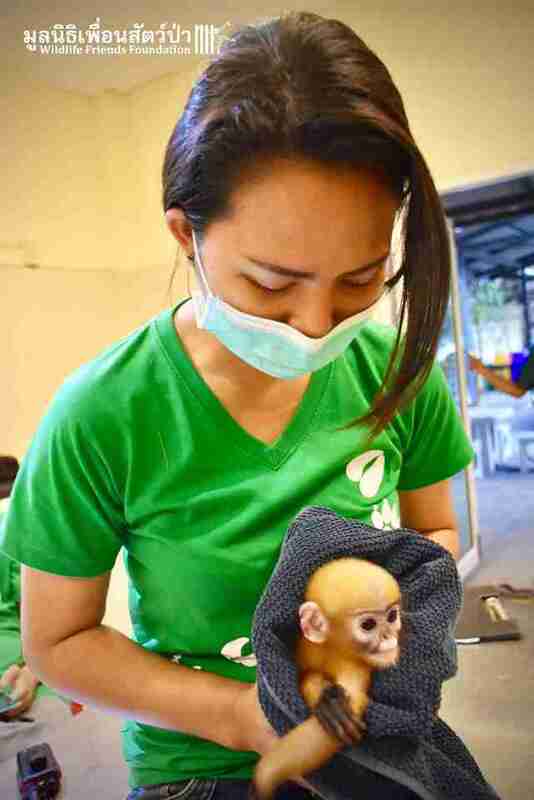 Back at the rehabilitation center, Vincent was given a health checkup and was given the opportunity to rest and explore. 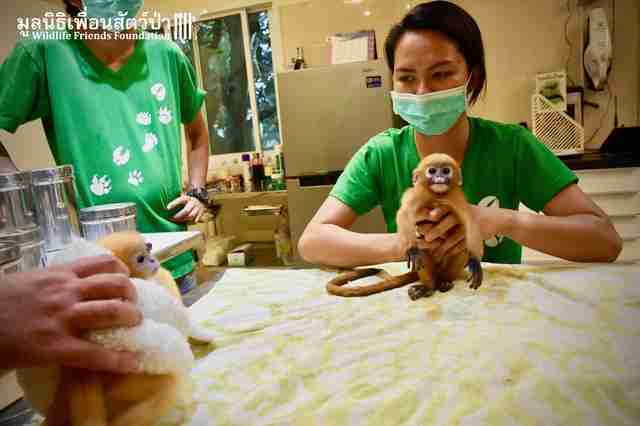 Once veterinarians determine he's healthy enough to be around others of his kind, he'll be gradually introduced to a special new friend — an extremely important step, since monkeys of all kinds form tight social bonds. 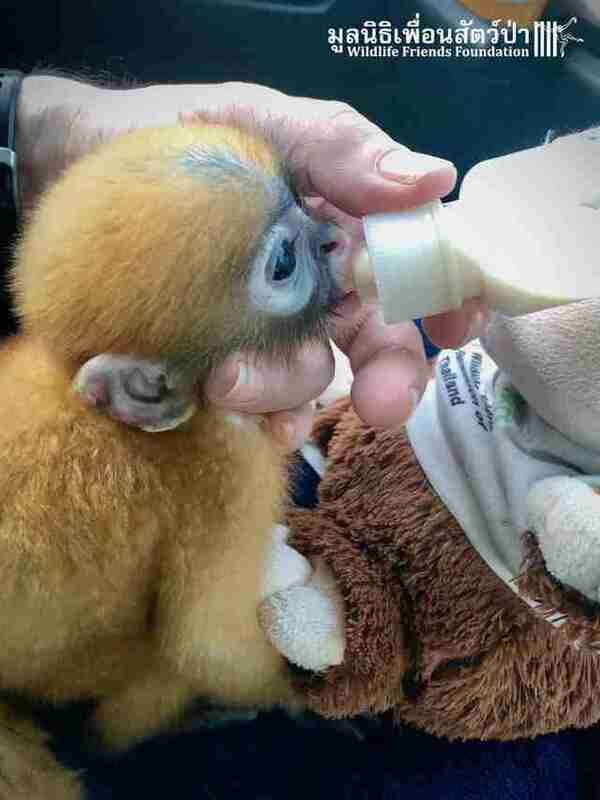 "We hope that he will be able to join Kanoon, our other recently rescued orphan baby langur, and together they will be able to play and develop," WFFT wrote. "We cannot replace their mothers or troops ... but hopefully they will be able to form part of a new troop with our other babies at the wildlife rescue center." To help the people at WFFT care for Vincent and all the other animals they save, you can make a donation.